Here are some great ideas regarding attic decorating. 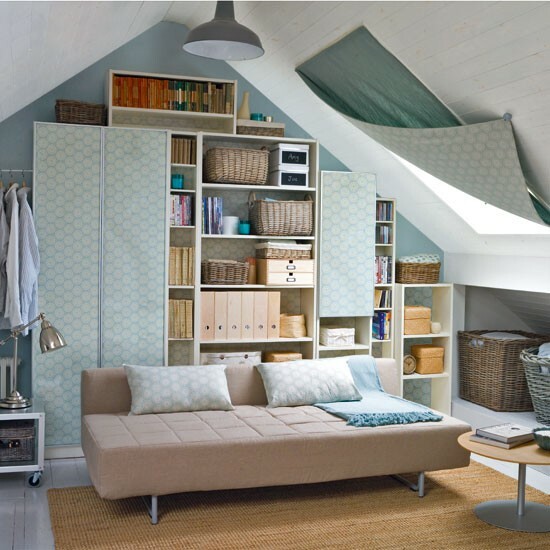 Cotton fabrics in neutral tones create a snug space - perfect for a cosy attic living room. Make over floorboards with a coat of white paint, and add an inexpensive jute rug to muffle footsteps. Find a similar rug at IKEA. Make the most of the available storage space under sloping ceilings with an assortment of units in different heights. This style of bookcase, fits into an awkward space, making it a brilliant alternative to bespoke cupboards, and they're quick and easy to assemble. 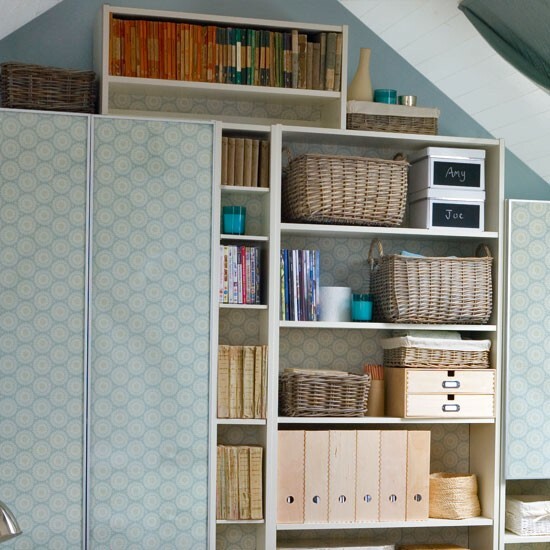 Customise the backs of shelves and glass cupboard doors with matching wallpaper for a co-ordinated look. Keep open shelves looking neat by storing clutter in these handy wicker baskets. The bookcase, glass doors, and extension unit are all IKEA. Skylights are the most common type of window in an attic room and can make fitting a blind or curtains a little tricky. 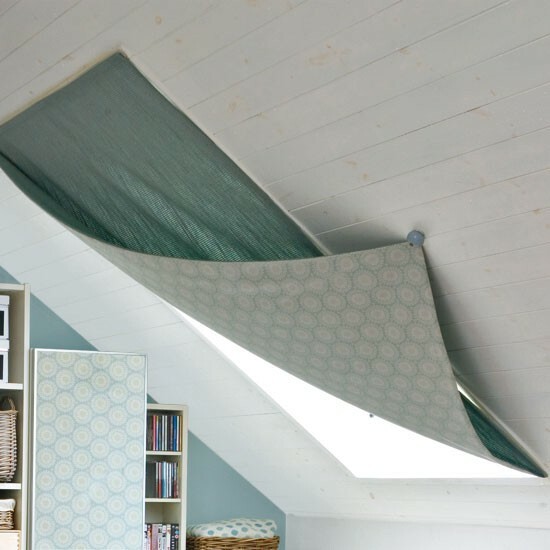 For an instant window treatment, make a simple fabric sail - just use two constrasting pieces of material back to back, and attach to the top and sides of the window with Velcro strips. To open the blind, simply unfasten one side and pin the corner back. The fabrics for the blind are from Villa Nova and GP&J Baker. 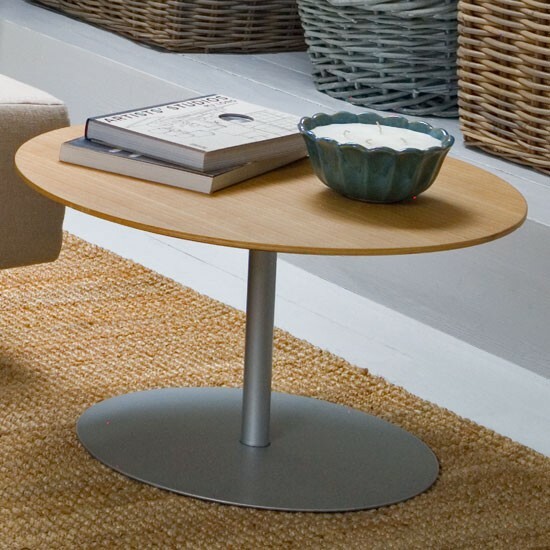 Lightweight multipurpose furniture that's easy to move around allows you to switch effortlessly between room functions. Look for storage trolleys on castors and large baskets for spare bedding and towels. Pillow shams made in a fabric that matches your blind and wallpaper are a great way to turn spare pillows into cushions. You can put them on a sofa without them looking too 'bedroomy' and then swap the shams for pillowcaes when you have guests to stay.